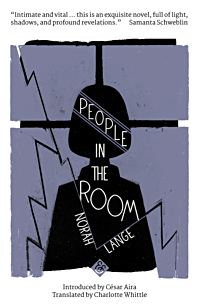 Born in 1905 to Norwegian parents in Buenos Aires, Norah Lange was a key figure in the Argentinean avant-garde of the early to mid-twentieth century. Though she began her career writing poetry in the ultraísta mode of urban modernism, her first major success came in 1937 with her memoir Notes from Childhood, followed by the companion memoir Before They Die, and the novels People in the Room and The Two Portraits. She contributed to the magazines Proa and Martín Fierro, and was a friend to figures such as Jorge Luis Borges, Pablo Neruda, and Federico García Lorca. From her teenage years, when her family home became the site of many literary gatherings, Norah was a mainstay of the Buenos Aires literary scene, and was famous for the flamboyant speeches she gave at parties in celebration of her fellow writers. She traveled widely alone and with her husband, the poet Oliverio Girondo, always returning to Buenos Aires, where she wrote in the house they shared, and where they continued to host legendary literary gatherings. She died in 1972. Charlotte Whittle has translated works by Silvia Goldman, Jorge Comensal, and Rafael Toriz, among others. Her translations, essays, and reviews have appeared in publications including Mantis, The Literary Review, The Los Angeles Times, Guernica, Electric Literature, BOMB, and the Northwest Review of Books. Originally from England and Utah, she has lived in Mexico, Peru, and Chile, and is now based in New York. She is an editor at Cardboard House Press, a bilingual publisher of Spanish and Latin American poetry.